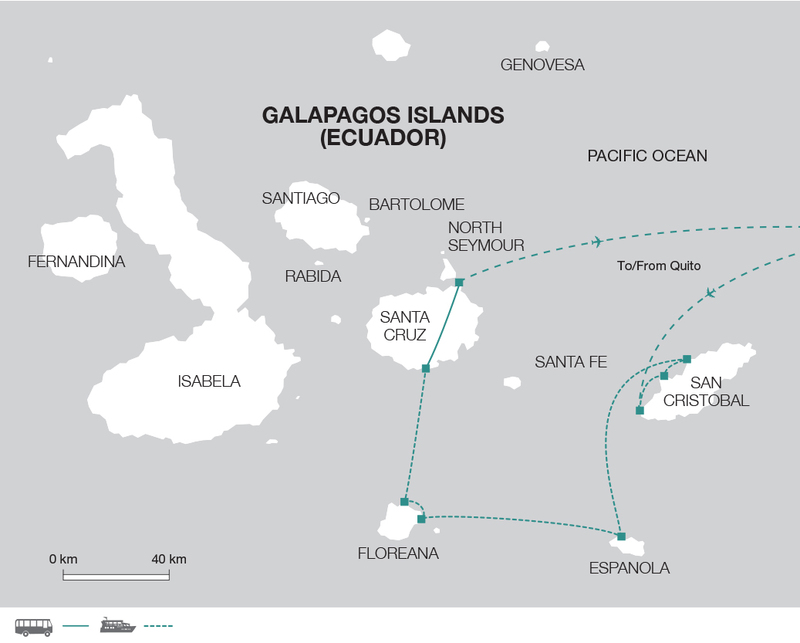 On this tour we spend four nights on the Monserrat embarking on a Galapagos cruising adventure through the archipelago's southern and eastern islands. Highlights include snorkelling with sea lions, visiting the Charles Darwin Research Station and witnessing vast numbers of marine birds. On arrival in San Cristobal, we will meet our naturalist guide and transfer to our home for the next four nights, the Monserrat. San Cristobal is the easternmost island of the Galapagos archipelago and one of the oldest geologically. The principal town is Puerto Baquerizo Moreno, the capital of the Galapagos. We will spend the afternoon visiting the giant tortoise breeding centre and observing the sea lions at Loberia Beach. Our first landing for the day is at Cerro Brujo, where there is a chance to go hiking, swimming and snorkelling. The sandy beach is home to Sally Lightfoot crabs, brown pelicans, blue footed boobies and California sea lions. A short distance away and visible from shore is an island called Leon Dormido, or 'Kicker Rock', which rises hundreds of feet above the ocean and resembles a sleeping lion. It is quite striking and if conditions are right we may be able to sail through a narrow channel which splits Kicker Rock in half. An incredible snorkelling spot, Kicker Rock is home to an incredibly diverse set of marine life in the nutrient-rich water and is also inhabited by large numbers of seabirds. Later in the afternoon we stop at Post Office Bay, which has a lot of history. A barrel was placed here in the late 18th century by English whaling vessels to be used as a post office. Passing ships would stop to leave mail for loved ones, collecting at the same time any mail destined for ports on their itineraries. Today the box is used mainly by tourists, who may drop off and pick up unstamped letters to be carried to far destinations. The remains of a Norwegian canning factory are the only evidence of the island's history prior to its designation as a protected area. A short hike up past the post barrel takes you to an interesting lava cave. With the aid of a torch, you can descend about 80m to the point where the sea enters the cave.